Vancouver, British Columbia--(Newsfile Corp. - September 14, 2018) - TerraX Minerals Inc. (TSXV: TXR) (FSE: TX0) (OTC Pink: TRXXF) is pleased to announce further assay results from the Company's summer field program on the Yellowknife City Gold project. 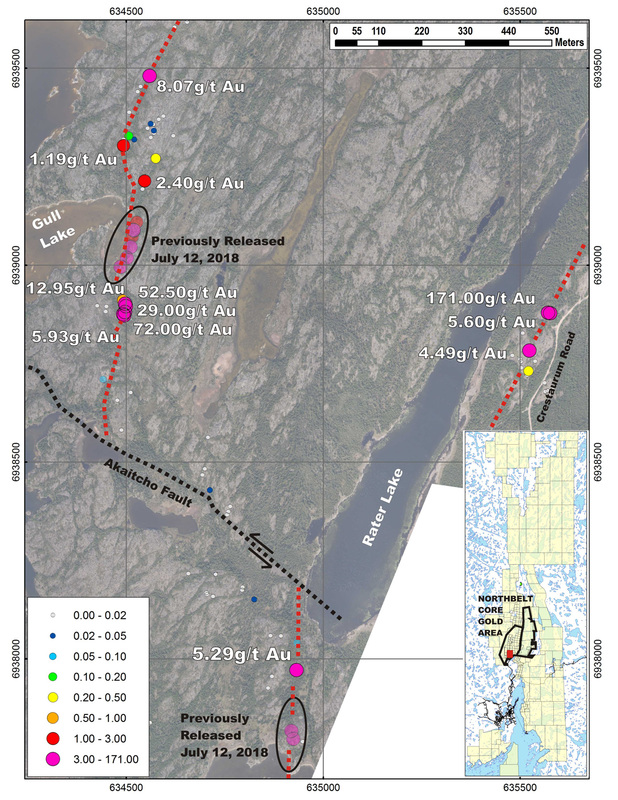 High grade gold assays from grab sampling have extended the strike of the Gull and Rater Lake zones. As previously reported these new targets are in the same mafic volcanic geology that also hosted the Giant and Con mines, and are within TerraX's Core Gold exploration area. The highlight assays are 171.0 g/t Au, 5.60 g/t Au, 5.29 g/t Au, and 4.49 g/t Au on the Rater Lake zones, and 72.0 g/t Au, 52.5 g/t Au, 29.0 g/t Au, and 12.95 g/t Au on the Gull Lake Zone. David Suda, President and CEO stated: "The results of our summer field work continue to feed our pipeline of drill targets." David Suda further stated: "It is highly encouraging to see surface results which extend potential strike to the Giant mine structure." Assay values from grab sampling at Gull and Rater Lakes range from nil to a high of 171.0 g/t Au. Sampling included insertion of certified standards and blanks into the stream of samples for chemical analysis. Samples were prepared at ALS Chemex's laboratory in Yellowknife and shipped to their Vancouver facility for gold analysis by fire assay and other elements by ICP analysis. ALS is a certified and accredited laboratory service. It should be noted that, due to their selective nature, assay results from grab samples may not be indicative of the overall grade and extent of mineralization on the subject area.